It’s raining AGAIN today. Oh well, at least I don’t have to water the flowers! I’ve been fishing and fishing but I can’t find the stupid rainbow trout for Ruby to complete her mermaid transformation. Curly had asked for a crucian carp and I found that (along with like 4 extra) right away. 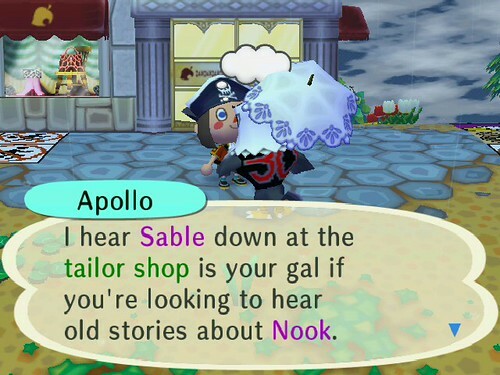 Apollo was standing outside Nook’s in the rain, talking about how Nook had a shady past. He said that the best person to talk to about this was Sable. But he said it might be tough since she’s not much of a talker. So I decided to pay them a visit. But Sable wasn’t talking today, not about the conspiracy, anyway. What I don’t understand is, for something that’s supposed to be on the DL, why does everyone in town seem to know about this? 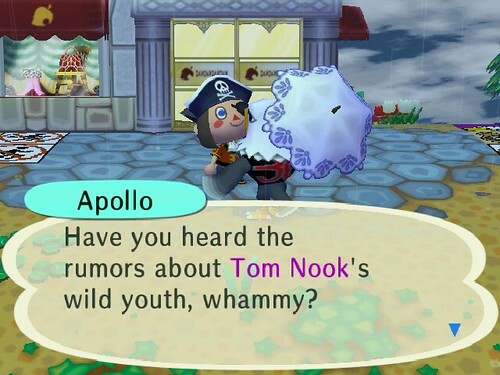 What's up with Apollo's lacy umbrella? 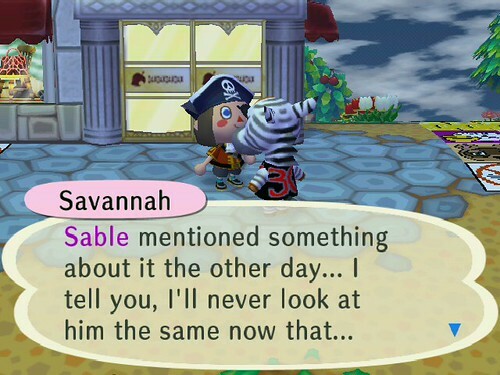 LOL, a few minutes later I walked past Nook’s and Savannah was loitering outside. And then SHE started talking about this too! How weird. I guess on days when the central characters aren’t talking about it, my townies will! Savannah refused to finish that sentence, out of fear of a certain raccoon that she owes bells to!